What is the inspiration behind your roller derby name? It’s my surname but I thought it made quite an apt derby name! I’d noticed the team practicing at Walker Activity Dome and was very intrigued to find out more about the sport. I popped along to a home game and signed myself up to the next round of fresh meat! Cycling, badminton and the occasional game of 5-a-side football. What is your proudest roller derby moment? 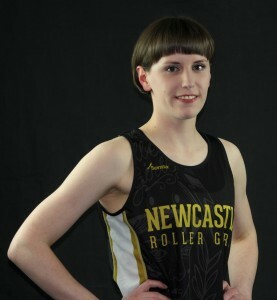 When I was rostered for my first ever Newcastle Roller Girls game as a North C!